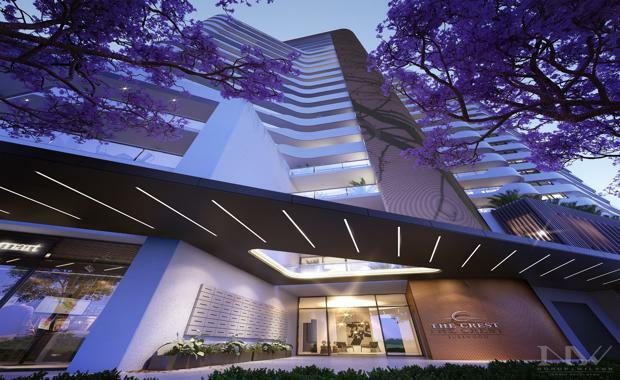 More than 180 apartments in the landmark 'The Crest - Burswood' mixed use development in Burswood, Perth, have been listed for sale for the first time through Ray White Centro on behalf of developers Norup + Wilson. The $100 million, 21-storey development at 112-118 Goodwood Parade, Burswood, is being marketed by Stephanie Taylor and Marcus Blake of Ray White Centro. Ms Taylor said a total of 182 one, two, and three bedroom apartments were available for sale in the complex in the Burswood Station Precinct. "The Crest will be a unique, landmark apartment complex as it sits on the high point of Perth's internationally recognised, five star Burswood resort enclave," she said. "Residents will enjoy amazing views of the rapidly growing mix of attractions in the Burswood precinct including the new 60,000 seat Perth stadium already under construction.